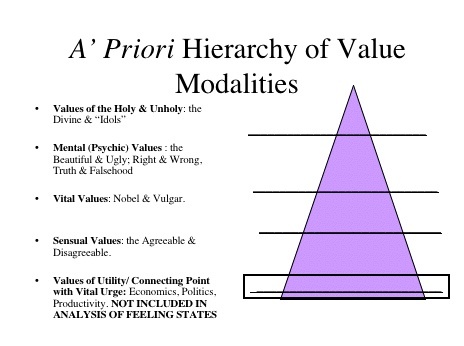 You might be familiar with Maslow’s “hierarchy of needs”, but perhaps more interesting is Max Scheler’s “hierarchy of values”. Then he describes those psychic feelings which have an ego quality – “happiness, sympathy, enjoyment, sadness, sorrow, anger, jealousy” – those which generate our values of beauty, truth and justice. It can take a wee bit to get your head around this, but I do think it’s worthy of exploration. Hmm – Think it would be worth the contortions to get my head round this but wonder, as with Maslow’s (and the Egypytian ones) if i will ever get to the top?! Ah well, there’s the rub! I am willing to bet you already experience a LOT of the “top” layers! Like the ancient greeks and their philosophies and democracy, not all had the appropriate hairstyles and ways of speech to fully build a brick.